Imagine if the lights across America suddenly went dark, thanks to a hack attack on power grids. Cyber attacks on the electricity system are becoming more sophisticated and more common. The Bipartisan Policy Center asked experts in energy operations and national security to compile recommendations to strengthen grid cyber security. 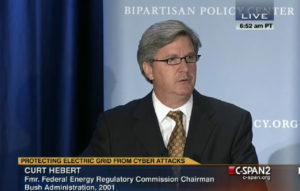 Curt Hebert is a former Federal Energy Regulatory Commission chairman and one of very few people that has done extensive research, publication, speeches and interviews on both infrastructure and cyber security with a deep understanding and experience in the energy fields. The smart technologies have to make the business case from a financial point of view, but also from a security point of view.Curt also happens to be a rare bird in that he has served and regulated at the local, state and federal levels and served as Chairman in all regulatory capacities and done work internationally as well as being an attorney and second in command for a Fortune 250 company for a decade. His experiences (regulatory, regulated, atty) have given him a prism to look through which allows clients to see a perspective that allows them to deliver energy that can be compelling to regulators, customers and shareholders (corporate). Making all three happy is challenging, but Curt has been down all 3 roads. Mr. Curtis L. Hebert, Jr. served as an Executive Vice President of External Affairs of Entergy Gulf States Louisiana L.L.C. since 2001. Mr. Hebert served as an Executive Vice President of External Affairs of Entergy Louisiana LLC since 2001. Mr. Hebert served as an Executive Officer of Entergy Texas Inc., Entergy New Orleans Inc., and Entergy Louisiana Holdings Inc. (formerly, Entergy Louisiana Inc.). He served as an Executive Vice President of External Affairs of Entergy Corporation since September 1, 2001. He served as an Executive Officer and/or Director of various other wholly owned subsidiaries of Entergy Corporation and its operating companies. He served as Chairman and Commissioner of the Federal Energy Regulatory Commission from 1997 to 2001. He served as Chairman and Commissioner of the Mississippi Public Service Commission from 1992 to 1997 and a leader of the Mississippi Legislature. Prior to becoming an Entergy executive, Mr. Hebert served four years as a presidential appointee to the Federal Energy Regulatory Commission. 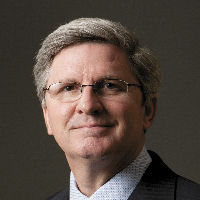 He was named to a Republican seat on FERC by President William J. Clinton in 1997 and was elevated to chairman by President George W. Bush in January, 2001. His public service began with his 1987 election to the Mississippi House of Representatives, where he served until 1992. During that time he chaired both the House Oil and Gas Committee and the House Ways and Means Severance Subcommittee. In 1992, he was appointed by Governor Kirk Fordice to the Mississippi Public Service Commission. He served as President of the Southeastern Association of Regulatory Utility Commissioners and a member of the executive committee of the National Association of Regulatory Utility Commissioners. He is a member of Mississippi Bar and the Energy Bar Association. Mr. Hébert has completed the Nuclear Reactor Technology Program at the Massachusetts Institute of Technology and received a Bachelor of Science Degree from the University of Southern Mississippi and a Juris doctorate from Mississippi College School of Law.